A Hunnic warrior with composite bow. Barbarian Warriors: Celtic nobles depicted. Roman Soldiers in close formation. There existed a wide variety of ancient warriors, wider than Napoleonic or Modern Times. While more modern armies can be divided up into what we now call traditional branches of the military, ancient warriors only developed such distinctions later. At first ancient warriors organized themselves into whatever military arrangement suited them best militarily in their particular time and place. This is to say that they specialized in a particular weapon that was successful in their particular habitat. Eventually large empires or confederations began using them in a combined arms sort of way. Particular ethnic groups that had particular skills where used for them, while their weaknesses could be covered by other ancient warriors specializing in another style of combat. What came out of the wash was a wide variety of ancient warriors; here are their general categories, steppe warriors, barbarian warriors and the infantry of the “civilized” Greco-Roman world. Additionally, light tribal infantry and cavalry could be included in this mix. Essentially, there are a lot of types of ancient warriors, and that what makes them so interesting! However, in order to make this an article instead of a book we will focus on just the first three mentioned groups. Ancient warriors: Steppe warriors, Barbarian Warriors and a Phalanx of Macedonians. From the vast plains of the Eurasian steppes armies of mounted warriors would periodically burst forth to devastate the sounding civilizations. The settled peoples rimmed the bottom and sides of the vast steppes stretching for 3500 miles in a belt from Eastern Europe to the Pacific Ocean, a land populated by many tribes of nomads. When these groups periodically joined together they rained havoc on the civilized world. They spread forth in waves, devastating the settled nations and empires on their borders. Many of the greatest civilized empires in history fell to these warriors, from China to the Western Roman Empire, including the Persians and Indians in between. The steppe warrior’s used many ancient weapons, however, their weapon of choice was the composite bow, a powerful long range ancient weapon used to devastating effect. Civilized societies typically referred to armies of steppe warriors as hordes, however, that label isn’t very accurate. Over the centuries of continuous warfare in the vast steppes these warriors perfected mounted tactics. The most common tactic was to shower the enemies with arrows while staying out of range, groups of mounted archers would dash into range, let loose their arrows and dash out again before a response could be mounted. Once their enemies were sufficiently demoralized they would then take the opportunity to close with their secondary weapons. These close combat weapons include lances, swords and even lassos. Another favorite tactic of these mounted warriors was to feign a retreat, causing any enemy cavalry to charge after them and into an ambush. Once they had dealt with the cavalry they would then return to finish off any enemy infantry their impetuous cavalry opponents had left behind. 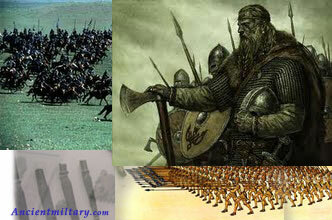 Steppe warriors became advanced in the use of formations as well, peaking with the Mongols military structure. The Mongols organized their armies logically in groups of 10, 100, 1000 and 10,000 creating an easily commanded but flexible system. However, steppe warriors in general were all very self-sufficient. Capable of river crossings alone and isolated survival, these nomads required little in the way of supplies. These were warriors who lived in the saddle from a very young age and came from a society where every man was expected to be a warrior, and often the women too! They were known for being ruthless butchers by those they opposed and fear of them was wide spread in the ancient world. It has been theorized since they all were butcher’s in order to survive as herders, the butchering of defeated humans just seemed to follow suit. They went by terrifying names to those who settled around them, the Huns and Mongols for example! Less known are the Scythians, Sarmatian and Xiongnu. These mounted warriors dominated the plains of Eurasia and destroyed empires in the settled world up until the invention of gunpowder broke their power in the 1600’s. Perhaps the most iconic of the ancient warriors, barbarian warriors included the bearded, sword wielding maniacs that images of ancient warriors often depict. The truth often wasn’t far off! They would sweep into the civilized world in vast hordes, wrecking armies with a combination of sheer terror and overwhelming numbers. They often were better at one on one combat than formations, but there charges were feared and deadly. These ancient warriors lived a more agrarian lifestyle than the nomadic steppes warriors, but they usually weren’t any more “civilized”. In fact, to the ancient Greeks, both groups were considered barbarians. Infamous groups of these barbarian warriors included the Vandals, Goths and Celts. The ancient Slavs, Germans and Iberians can be also be added to the long list of barbarians. These warrior societies developed fierce and proud warriors, individual performance in battle meant great prestige for them in their societies. Hence, to the “civilized” Mediterranean world they seemed undisciplined in battle, which they usually were. However, they often made up for this with sheer strength. Sometimes that strength was in the style of Conan, but more often it was the strength of numbers. The rush of a barbarian horde was the stuff of nightmares, only highly disciplined troops could stand before its impact and not flee in the grips of terror. These large men, in comparison to the Mediterranean’s, would charge headlong into enemy lines with a fury unmatched in the ancient world. Their goal was to scare, hack and crush enemies. The Roman military was born after a crushing defeat by a Celtic horde using these tactics. However, these Celtic warriors were also known for being cunning, if crude. Another favored method of warfare employed by them was ambush and hit and run tactics. Despite these strengths the barbarian warriors typically suffered from some short comings. They almost always lacked, but made up for it somewhat with shields and mobility. Sometimes they even fought naked, that’s unnerving, if somewhat stupid. They also typically lacked discipline, their command and control was often more like a mob than an army, and this lost many battles for them. Perhaps there greatest weakness though, was turned into their greatest strength. Barbarian armies had supply issues, causing them to only be able to take to the field for short times compared to the nomads and “civilized” armies. However, they often laid down roots, literally, in territories gained from warfare. In time this meant that they were able to control vast tracts of land. In Europe the most successful of these tribes formed the bases of the modern nations found in its borders. Although they lost the characteristics of what we consider to be barbaric warriors, these ancient peoples formed the backbone of all the European countries and by extension much of the world. From the barbaric tribe of the Angles comes modern English, perhaps the most widely spoken language on the planet. We can thank these peoples for the modern countries of France, Germany and Russia. We can even include them largely in the makeup of Italy, America and Australia. Perhaps surprisingly, among Western Nations this group of ancient warriors proved to be the most successful in the long run. However, they absorbed the both the lessons of fighting the steppe warriors and the culture of what I have been referring to as the “civilized world”. This brings us to the final group of ancient warriors, the heavy infantry of the ancient Mediterranean. The ancient Greco-Roman warriors were the pros of their world and the top warriors of their day. The Spartan military and Roman military are the top to dogs in this style of warfare. Although separated by time both of these militaries adopted similar principals. Both were well armored, well trained and motivated. In general the Greeks, Macedonians and Romans pumped out the greatest heavy infantry units of the ancient world. In an age when control of the battlefield was often the key to victory the heavy infantry excelled. While Greek warriors tended to prefer spears, Roman weapons tended to be heavy javelins and swords. They developed tactics through centuries of warfare between themselves, as did the other groups, but the Mediterranean’s perfected the art of armor at a much earlier age and were able to fund its high costs for a millennium more than anyone else. These ancient warriors were supported by advanced civilizations, highly skilled in mathematics, engineering and writing. This gave them a large edge in the critical area of logistics when compared to the barbarian hordes at their boarders, being able to field armies for much longer periods. It also served to produce competent generals more frequently. However, the greatest advantage they had was their disciplined heavy infantry. The Romans, Greeks and Macedonians produced top tier heavy infantry units. The things they shared in common were discipline, heavy armor and advanced tactics. This often gave them an edge against the barbarian armies, even when heavily outnumbered. Although these armies were considered the “civilized” forces of the ancient world, discipline and training was harsh. For example, Roman units that retreated without orders could be subject to decimation. In decimation one in ten soldiers are selected by lot and beaten to death. Their treatment of defeated foes could be just as harsh; cities that resisted could have all males put to the sword and their remaining population sold into slavery. In the year 146 BC the Roman’s destroyed both the once mighty cities of Carthage and Corinth, killing or selling all of their inhabitance. The cities were raised to the grown, a terrifying example of what happens to those that resist Roman power. Although the “civilized” warriors were eventually defeated or absorbed by barbarian elements, at least in Western Europe, the civilizations they created became the standard model for what is now called the West. Greek and Roman architecture can be seen in the civic buildings in the United States, Europe and even Australia. The ideas these ancient warriors carried with them had longer lasting effects than even their great skill with arms.